This past weekend I visited my family in South Carolina to celebrate my Dad’s 75th birthday. It was one of those trips where you re-connect with family, friends, and many people you have not seen in years. One of my best friends in the world joined us because we met during our first year in college so she knows my family very well. She and I started out as sorority sisters, then became roommates, and over the years have traveled the world together, been through her divorce, the birth of her son, my crazy career moves, death, and much more. Driving in the car together she shared with me that she and her 11 year son had attended an event in her hometown the day before. Buddhists were in town to create what’s called a Mandala at the Chapman Cultural Center in Spartanburg, SC. 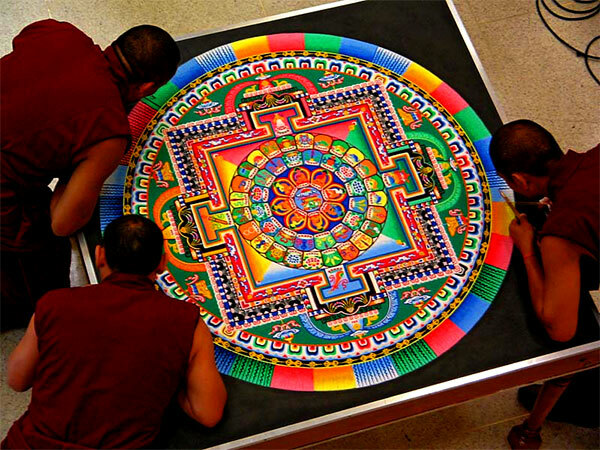 The Buddhists spent days meticulously creating the work of art with colored sand. They often meditate while doing it and visitors can watch the creation come to life. I had seen this done before in North Carolina years ago. I always thought it was incredible. Since reading the explanation and seeing the picture below, (click on picture to enlarge) my friend and I are applying the principles to many things in our lives. We are looking at relationships, our favorite possessions, even an old sentimental t-shirt she could not let go of even though it was stained beyond repair. My hope is that you take a minute to look at your life and what you consider your prized possessions, and just for a moment, realize, none of it is ours to own. The people in our lives are there because they want to be. If they leave, you have to let them go. 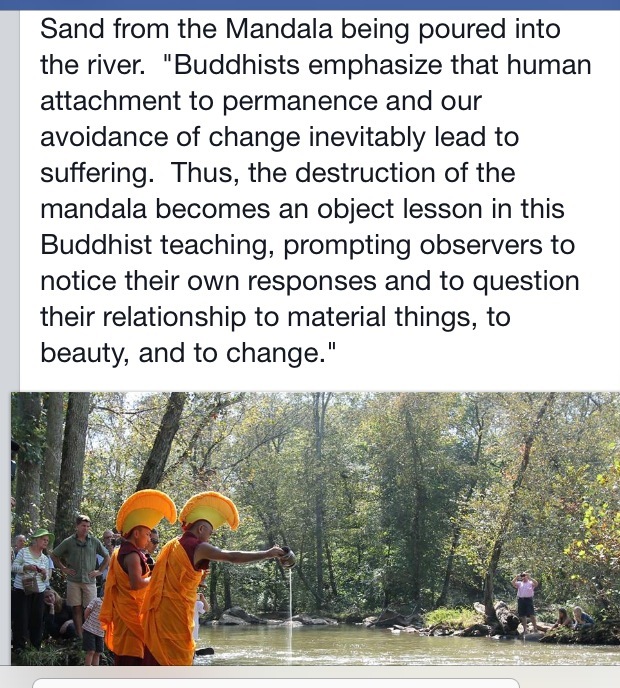 The beautiful objects like jewelry, cars, even golf clubs do not make us happy. It is only a temporary thrill. We will want something else beautiful tomorrow. Letting go of our attachments, living in the now, and accepting that change is inevitable might help us live each day with just a little more gentleness.